The military has always looked toward new technologies to keep its soldiers fed while in the field. Canned food, for instance, was first created to provide sustenance for Napoleon's troops. Now the U.S. Army is investigating 3D printers as a way to produce more nutritious, and hopefully tastier, military rations. 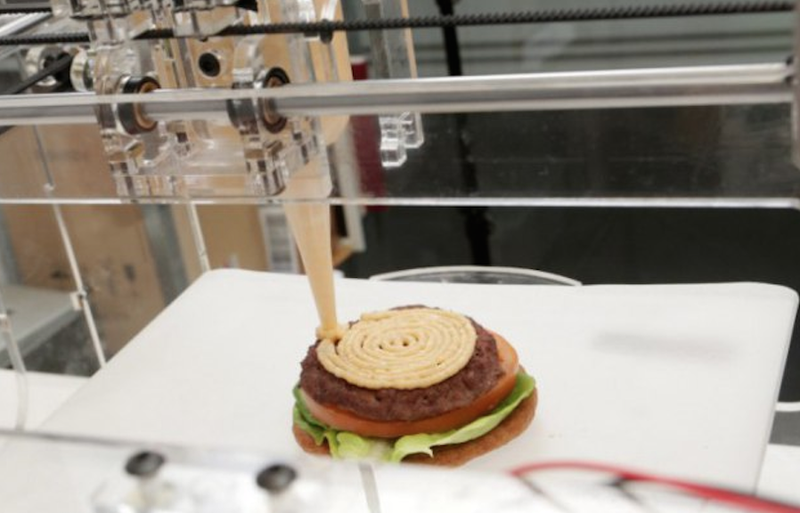 Food printing is still a burgeoning science, limited to very specific applications. 3D Systems' Chefjet produces uniquely-shaped candies and cake toppers, while the Foodini printer can make pasta dough and ravioli. But more companies are looking into the prospect of 3D printing meat, or meat alternatives made from vegetable products with protein additives. Currently, most 3D printed foods consist of a paste that comes out of a printer and is formed into predetermined shapes. The shapes are eaten as is or cooked. Army food technologists hope to further develop 3D printing technologies to create nutrient-rich foods that can be consumed in a warfighter-specific environment, on or near the battlefield. Nutritional requirements could be sent to a 3D food printer so meals can be printed with the proper amount of vitamins and minerals, thus meeting the individual dietary needs of soldiers. "If you are lacking in a nutrient, you could add that nutrient. If you were lacking protein, you could add meat to a pizza," Oleksyk said, adding that individual needs could be addressed based on the operational environment. "Say you were on a difficult mission and you expended different nutrients...a printer could print according to what your needs were at that time." "We are thinking as troops move forward, we could provide a process or a compact printer that would allow soldiers to print food on demand using ingredients that are provided to them, or even that they could forage for," Oleksyk said. "I've been here long enough to see some of these 'no ways' become a reality. Anything is possible."